"Around Halloween, our babysitter would take the pumpkin seeds from the carved pumpkins, roast them a few minutes in the oven, and then make this bread. You can also use store brought seeds if you prefer." Place the ingredients into the bread machine in the order recommended by the manufacturer. Select the whole wheat setting and press start. If your machine has a signal for fruit or nuts, add the sunflower and pumpkin seeds at the beep. This pumpkin bread is dense, moist, and flavorful. 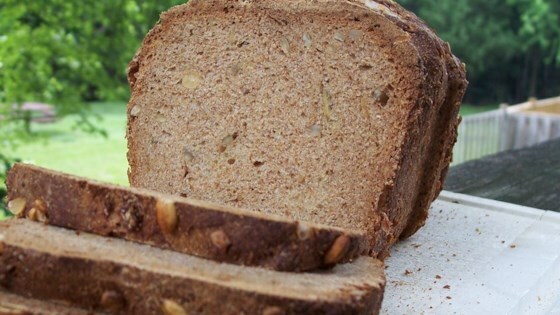 For a less dense loaf, you can substitute bread flour for half of the whole wheat flour. To make this recipe in a stand mixer, combine all of the ingredients except the vegetable oil in the mixing bowl. Mix on low speed using the dough hook, scraping the dough down occasionally, for 10 minutes. Add the oil and mix for an additional 2 minutes. Transfer the dough to a greased bowl, cover it with plastic wrap and a kitchen towel, and allow it to rise until doubled, about 1 hour. Grease a 9x5-inch loaf pan. Deflate the dough and turn it out onto a lightly floured surface. Flatten the dough into a rectangle, pressing down with your hands to pop any air bubbles. Fold the dough into thirds, rolling it slightly under your palms to form a loaf, and pinch the seam to seal. Place the dough into the loaf pan, seam-side down, cover it with a floured kitchen towel, and allow it to rise again until doubled, about 30 minutes. You may brush the surface with water or milk, if desired, and top it with extra pumpkin or sunflower seeds for a lovely appearance. Bake the bread in a preheated 350 degree oven (175 degrees C) until golden brown, 30 to 35 minutes. Remove the bread from the pan and cool on a wire rack. I made this bread today and it was fantastic, I wouldn't change anything. I can't believe that someone would give this a 1 star just because of the title that is STUPID!!! My bread sank. And it tasted like it was lacking salt. The kids love it, but too sweet for me. Next time I'll add less honey, and a bit less water as it sank. Other than that, great! This bread was not a hit in our house. It turned out quite dry and dense and it didn't seem to have much flavour to it. I made it using a mixture of pumpkin, sunflower and pine seeds. It turned out great!